No more handwritten paper charts and polaroid pictures to keep track of each actors look for a specific scene. Continuity can be a dificult and daunting task, especially if there are various looks for the actor and the project is being shot out of sequence (which happens 99% of the time). 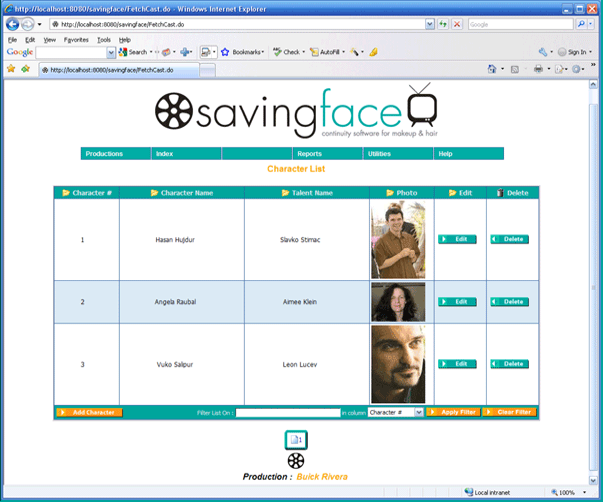 This software has been used for movies like Rum Diaries and TV shows like Ugly Betty and many more. I am intrigued by this software but it is not cheap, at $349 for the standard version. If you are part of the Union, or a Student the price is $275.00. The also have an additional Special Makeup Effects Module for $99.00. The software is availalbe for MAC and PC, and you don’t have to have internet connection to use it. There is a demo version of the software you can download for free. There is even how-to videos on the site. I don’t know about you, but I am going to download the free version and see what it’s all about. Please feel free to leave comments and let me know what you think. If you or a friend has tried SavingFace, leave me a comment. I would love to hear about it.